Some had likely never worshiped in Spanish before. Others had probably never experienced firsthand the high-octane energy of urban gospel. History suggests that few had likely ever been in a setting where three cultures converged in the name of Christ. 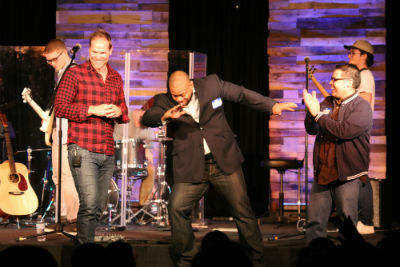 But that’s exactly what happened at the first-ever ONE event, which took place at Church at the Crossing in Indianapolis, Indiana, on April 21 and 22. The result was a glimpse of heaven and a renewed desire to change the world together. Like other youth conventions, ONE featured skilled bands and an auditorium full of teens singing at the top of their lungs. 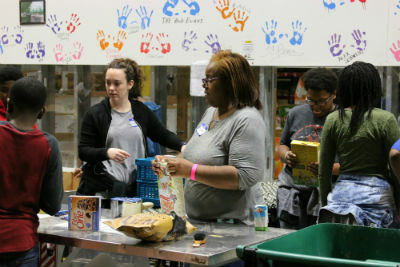 Like other youth conventions, community service challenged students to put their faith into practice, while games and good food fostered fun and fellowship. 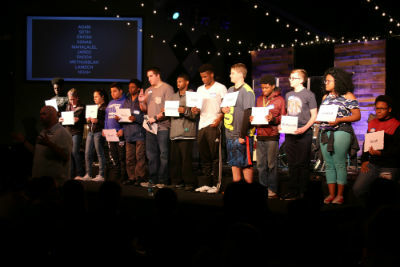 Like other youth conventions, ONE welcomed excellent communicators to the stage, each with a keen ability to connect to students in their unique life circumstances. Unlike other youth conventions, ONE put together students representing multiple cultures in one place, at the same time, for one purpose, who might never have otherwise come into contact this side of heaven. Photo: Kevin Earley (center) with Andy Stephenson (left) and Ramon Rivera (right) looking on. In most Church of God congregations, children grow up with anticipation of their chance to enter the youth group or the high school student ministry. With such a milestone also comes the realization that they’ve finally reached the age where they can attend the International Youth Convention. But not every young man or woman in the Church of God has that kind of connection to IYC. Some look forward to NIYC—the National Inspirational Youth Convention—with a similar eager spirit. Others look forward to life-changing events sponsored by the Hispanic Council (Concilio Hispano). Those events which are most anticipated often seem to fall naturally along cultural and ethnic modes of identification. Sadly, the landscape of the Church of God sometimes looks more like a textbook definition of segregation than the unity which we so espouse. When teenagers of multiple ethnicities came together for worship, service, and community for the ONE event, they set an example for the rest of us. Called not only to worship together, but serve together, too, teenagers piled into vans, destination: Gleaners Food Bank. A few hours were given back to the community as countless pounds of food were sorted and prepared for distribution to the needy. During the experience, it wasn’t uncommon to hear teenagers chanting in unison: “We are one, we are one, we are one!” It was a sight rather uncommon in the world today. Photo: Serving TOGETHER at Gleaner’s Food Bank. That was a pretty cool moment for everything in the room. Still, it might have been a little awkward for some to worship in a style different than their norm, yet everyone seemed to come away enriched by the experience. “When we focus on the mission instead of the differences of methods, Jesus is glorified,” Humberto Mena, speaker for the Concilio-sponsored service said. “Unity glorifies God because it points to Christ!” Through worship in both English and Spanish, it was hard not to imagine the massive crowd in heaven lifting their voices in praise as described in Revelation 7. Photo: Adam Rentas recruited several volunteers for his Jesus-in-Genesis-5 illustration. How can we carry out the unity which is ingrained in the very heart of the Church of God? Tim Quainoo, speaker for the NIYC-sponsored service, made it clear that, instead of offering healing and hope, too often we keep our distance from each other. Only the love of God through Jesus Christ makes it possible to glorify God in such unity. “It is our love for God, our love for people, which enables us to live a life that honors God,” he concluded. It was in this spirit that 233 students, representing twelve states and thirty-plus churches, departed Church at the Crossing in Indianapolis, Indiana, to go love. Download a free seven-day follow-up devotional to the ONE experience at www.chogy.org/one-event/. Across the United States, and around the world, God is on the move in the Church of God. Join the movement. Reach our world. Donate today at http://www.jesusisthesubject.org/reach-our-world-fund/. This entry was posted in All Church of God, Youth Ministries and tagged Adam Rentas, Andy Stephenson, CATC, Church at the Crossing, community service, Concilio Hispano, convention, diversity, Gleaner's Food Bank, high school, Hispanic Council, Humberto Mena, IN, Indiana, Indianapolis, International Youth Convention, IYC, Kevin Earley, multi-ethnic, multicultural, multiethnic, National Inspirational Youth Convention, NIYC, ONE Event, Ramon Rivera, students, teenagers, teens, Tim Quainoo, unity, worship, youth. Bookmark the permalink.